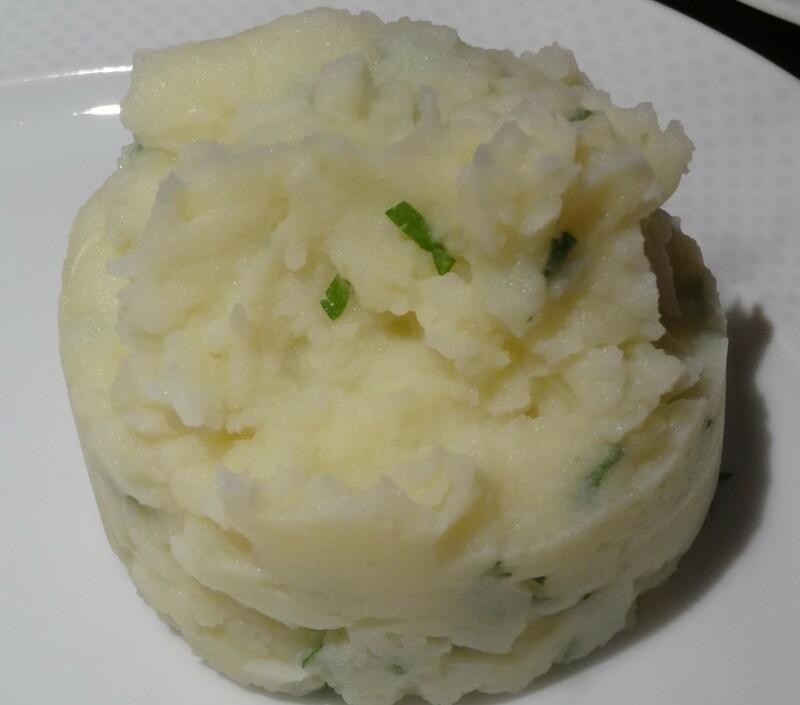 This mashed potatoes made with roasted garlic is delightfull. It’s perfect with beaf (roasted beaf, tournedos, steak) and fish. You would say it’s pretty obvious, but the start of mashed potatoes is a good choice of potatoes! It will make a tasty and creamy dish. With almost 300 kinds of potatoes cultivated in France, the choice can be hard! To simplify, you should choose a floury flesh kind of potatoe, like the Marabel, the Agria, the Caesar, the Manon, the BF15 or the Bintje. Those two lasts are my favorites! If you have any doubt, ask your grocer! One last piece of advice, choose a hight-quality garlic like pink garlic ( the one I use). But most of all, don’t use sprouted garlic! Preheat the oven thermostat 180°. In a small plate you can put in the oven, put the garlic cloves moisten in olive oil and cook it in the oven for 30 min until garlic is soft. When it’s cooler, extract garlic flesh. In the meanwhile, peel and cut the potatoes. Cook them in a lot of salty and cold water for about 25/30 min. Warm the milk. Strain the potatoes and crush them with a potatoe masher and little by little, pour the milk. Add the butter and the garlic flesh. Check the seasoning. Mix well. If you serve it immediatly, add chopped parsley. If you don’t, wait until the last time to add the parsley. Little tip : Mashed potatoes tend to « make a crust », to avoid this problem, make thick mashed potatoes, level out and pour one centimetre of warm milk on the top. It won’t « make a crust » and you’ll just have to mix at the last moment! Once you have tasted it, you can change the flavour by putting more or less roasted garlic.